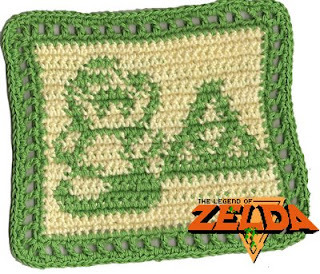 Yet another free crochet pattern – Link from Zelda. Will this kindness never end? Yes, I did it again. Far from being content at offering the world my free Jolly Roger pattern, I set to work to create yet another masterpiece, this time in the form of the wonderful Link from the Legend of Zelda. He’s not exactly perfect, but I’ve tampered with the final pattern which means that your version should come out a lot better. Please do let me know if you make one of these – the validation makes me feel… well… validated (wrote myself into a bit of a vocabulary cul-de-sac there). As before, the pattern can be obtained from the wonderful Crafty Crafty blog here, edited by the marvellous Abi Silvester, who also edits our green blog, Hippyshopper. She works very hard editing both those blogs for us, so do go and visit one of her sites and leave her some nice comments. It makes *her* feel validated. I should probably also mention the fact that it’s thanks to the wonderful artistic talents of my other half, Alex Milway (to give him his full name to help his Google rankings), who made the pattern for me from his childhood memories of Zelda and nothing more. He really is very clever. Annoyingly so, in fact. But don’t tell him I said that. By the way, if you would like to read the blog of the world famous children’s author and illustrator, Alex Milway, you can do so here: www.themousehunter.com/blog. You can also leave him some comments if you like – he’s also a fan of validation. Because I’m such a nice and lovely person, I made a pattern especially for all the readers of Crafty Crafty. If you suddenly realise, upon looking at this, that your life has been an empty and meaningless existence without a skull and crossbone patch, you can download the pattern and create your very own Jolly Roger forthwith. It’s a good job I was here, that’s all I can say. Get the free pattern here! Fill your heart with joy. The lack of blogging recently is truly shameful, especially since I finished this pink shrug thing ages ago and now have a small backlog of recently made items to blog about. Last night I started browsing some of my favourite crafty blogs (something else I’ve been remiss in lately) and the fire of blogging enthusiasm was rekindled within me. So here I am, ready and willing to discuss stitch issues and other gripping wool-related incidents. I’m feeling pretty good about how this particular garmet turned out. Why’s that, I hear you ask (those that have actually managed to make it to this second paragraph)? Why, it’s because I made the pattern up all on my very own (actually, that’s a *slight* fib – I used the excellent pink shrug schematics from Crochetville to explain the dark arts of making up your own patterns). Now it’s not strictly the first garment I’ve mustered up using the power of my own mind, but the last one had to be abandoned once I realised the wool was just too stiff. 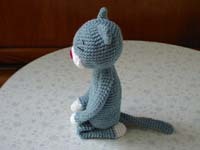 This one was made using an altogether floppier yarn, which worked out a treat. (Wool fact fans, it’s called Polysew Whisper So Soft, colour 107, 100% acryllic. I bought it from a little market stall and I haven’t been able to find mention of it online – apart from someone flogging it on eBay). The reason it’s not actually a full size cardigan as planned is because I’m far too impatient and just couldn’t be bothered to make it any bigger. Also, when I was coming back down the other side and reducing stitches, I made a point of reducing stiches in the same places I’d increased stitches on the other arm. Turns out, that doesn’t really work – and so there’s a twisting line going up one arm and a straight line down the other. I think that would be less obvious if I made a bit of effort to steam it, but as already mentioned, that would require effort on my part and I’m pacing myself. Finally, it’s plain to see that the most exciting thing in this picture is not actually the pink shrug but the amazing crocheted frock I’m wearing (with no small amount of self-satisfaction). The reason for the self-satisfaction is two-fold. First up, I was on holiday when that shot was taken and that’s me in our lovely B&B room (which was more like a hotel than most hotels) and the second reason is that the dress only cost me £15! FIFTEEN POUNDS! Bloody amazing. I can’t quite imagine ever being able to make such a gorgeous garment myself, and certainly not for that price. God knows what sweatshop it was knocked up in – although I like to believe that it was made using a crochet machine. I have no idea if crochet machines exist or not, but I hope to god they do – there’s so much crocheted stuff on sale at the moment for ridiculously low prices that the idea that they’re hand made is just too awful to imagine. I’ve nearly finished my shrug – just one little teensy tie to do. Really, I don’t know what’s taking me so long. It’s shameful. But I just seem to have lost the drive at the moment. Not that I don’t still grab my crochet as soon as I sit down in front of the TV, but recently I seem to simply hold it whilst gawking at the goggle box. Progress is pathetically slow. I suppose I did go through a period of not watching TV at all and only crocheting, so maybe it’s time to redress the balance with some proper square-eyed behaviour. Anyway, enough of my excuses, this is just a short post to say that I’m planning on jumping on that Amigurumi band wagon very soon. Crochet Me has a special on the little blighters and I really just can’t get enough of them. Just as with the whole crochet clothes business (and how I got sucked into it against my will) I’ve never had any desire at all to make crocheted toys – since they remind me of receiving crap presents at Christmas from my Grandmother (along with the thermal underwear, which funnily enough I’d probably rather like now). However, as with so much in life, the Japanese know how to make things that are a whole lot cuter than our western woolly ways. And look at these! It’s Amigurumi The Dogs! Dear me. I’m off for a lie down – this is all far too exciting. Never let it be said that I don’t try to run before I can walk. Fact is, I’m not much good at being a learner, which is why I tend to aim well above myself, often failing more often than I succeed. But, thankfully, this is only crochet, not some life or death situation, so failing really isn’t a problem. It just means a few wasted hours of your life (all unpicked in seconds) and maybe a few soft, silent tears. 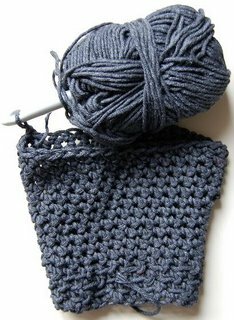 Since I was finding it impossible to match the free slouchy shrug pattern’s gauge no matter which hook I used (turns out I’m not the only one – someone on Crafster said the same), I decided just to make a pattern up instead. I’ve got a baggy (knitted) shrug that I bought from Zara and, on inspection, it turned out to be a very simple rectangle-based shape stitched together. With that, and with the aid of the excellent Fluggy Pink Shrug Schematics on Crochetville, I dreamt up a pattern that I was convinced would work. Only slight problem is, I think the lovely Rowan cotton I bought is just going to make it a bit too stiff. I got quite far up on arm before I decided that a softer, floppier yarn will work much better. It’s a pain because buying online doesn’t really give you an idea of what the wool will be like, but wool shops in London are very hard to come by – unless you want hand-dyed wool, spun by blind virgins in Wales, and then John Lewis can certainly help you. Lovely as that may be, if I buy enough of that to make a big slouchy jumper with, I’m going to be crocheting it out on the streets, with only a can of Gold Label and a dog on a bit of string for company. PS. I like the little bit of sweater stitch I did at the cuffs end.